At the start of my blog, today five years ago, I had no clear idea what form it would take. After a start with twelve posts in one month, most of them short notices, the frequency of posting did not reach that level again. Occasionally there have been four or even five posts within a month, but mostly just two or three, and this year I could not publish here more than just one post every four or six weeks. However low or high the number of postings it has been a joy to work on other features. It has been possible to expand the congress calendar from its tiny corner on my old webpages to a substantial page with due attention to both recurring and special events, attention for graduate seminars and guidance to other online calendars worth checking for the field of legal history. Legal history with a Dutch view has been the subtitle of my blog right from the start. It offered and offers me chances to change perspectives, to add humorous notes or detached comments, and to bring in my own surroundings, from the fortifications around Utrecht, an old library and the former provincial court in my home town to the dovecotes of the Voorn estate and a number of Dutch towns. Even the hamlet ‘t Woudt near Delft could thus become the subject of a post which turned out to touch on many subjects. My visits to the Frisian isles helped me to reconsider notions about nature, law and natural law. It is a joy to write about these real and imaginary travels from the known to the unknown, and to discover surprising connections or hidden histories and meanings. Sometimes you will have encountered here really long posts. One reason to write somewhat longer contributions is my desire to give you complete stories. Even in these long posts I often worried whether I was not just skating the surface of any theme or subject. The longest post here published in 2011 dealt with the transmission in print of Early Modern peace treaties. A specialist in the field of these treaties said he had learned new things from it, another scholar complained I should have made an article out of it. Both scholars have a point, and I added a summary post to present the main lines of that contribution more clearly. I must add that the initial spur for this post came from an article by Klaus Graf about the peace of Aix-la-Chapelle (1748). To many posts I have added one or more postscripts with some afterthoughts, links to useful websites or substantial corrections based on comments I received here. Gradually I have grasped the very nature of a blog, its intermediary state between nascent thoughts, ideas and proposals on a side, and on the other side full-fledged articles or even more ambitious publications. Writing here about a wide variety of subjects helps to form and refine thoughts about particular questions and problems. 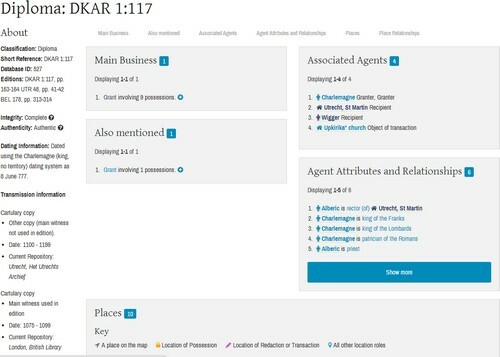 The use of categories and tags proved to be a tool to connect posts which at first look concerned completely different themes, periods and subjects. At the start of my blog I had no clue about the preferences of my readers. Would there be any readers at all? Some readers owe my great and lasting gratitude for their comments, proposals and continuing interest. The sheer number of readers has varied greatly according to the particular subject. It was a genuine surprise for me that a post about the Dutch lawyer Nicolaus Everardi (circa 1462-1532) attracted much readers. My comparison between two digital library projects, the Digital Library of America and the Deutsche Digitale Bibliothek, reached many people thanks to the alerts of some of my faithful readers. The day after the abdication of pope Benedict XVI in 2013 I could point to an article by a canon lawyer who had discussed papal abdication in modern canon law a month earlier on her blog. Her article deserved to be read, but as a side-effect my post reached an all time high number of readers. At this blog not only the posts matter. The blogroll in the right hand margin with some thirty blogs concerning legal history, a dozen law library blogs, twenty online journals and some twenty personal blogs connect whoever visits my blog to a much wider circle of historians and lawyers active both in the real and virtual world. For me it brings home the truth that the internet is a network which just happens to be virtual, but nevertheless first and foremost a network. Much time in writing any post was and is consumed by searching for valuable links to websites. I include them on purpose, not as embellishments or to show my research capacities, but as resources bringing you to primary sources, secondary literature, bibliographies or further information. It satisfies also my curiosity to look at all kinds of printed and digital resources for doing legal history. I invite you to use these links and delve into their riches! You do not harm me or my blog by using a post or one of its links only as a stepping stone. It is the very purpose of these links to bring you at least one step further in the pursuit of your own goals. Speaking of curiosity, the funny marginal image of the medieval scribe wearing glasses to read a charter appears in the margin of a pontificale, a liturgical manuscript, probably written and illuminated around 1450 for the collegiate chapter of St. John’s in Utrecht. Bart Jaski, keeper of manuscripts at Utrecht University Library, has published a very interesting essay about this beautiful manuscript. Jaski sketches its background and points to a number of elements connected with medieval canon law. I first saw this image in a volume on the history of the States of Utrecht [Van standen tot staten. 600 jaren Staten van Utrecht, Huib Leeuwenberg a.o. (eds.) (Utrecht 1975)]. Many years later I could not help recognizing a resemblance between this man and the famous Dutch archivist Samuel Muller Fzn. (1848-1922) who did much to reform and organize Dutch archival practice. He worked for nearly half a century at the Utrecht archives. The series of posts about centers for legal history came into existence thanks to the initial motive to start this blog. I have to thank Jörg Müller of the Leopold-Wenger-Institut für Rechtsgeschichte in Munich, who has done so much for the daily running of the Stephan-Kuttner-Institute for Medieval Canon Law, for asking me in 2009 to start blogging about legal history with the specific aim of discovering its possibilities and problems. Munich figured in one of the early posts in this ongoing series. For your benefit I have listed these posts and all posts which in fact amount to similar contributions about other institutions and cities on a separate page. Writing posts about legal iconography became a reality thanks to the remarks and questions of Mike Widener (Yale University). “Connecting centuries, countries and continents” was at first only a lucky alliteration in an early post, but in five years I have indeed tried to fulfill this promise wholeheartedly. Choosing this approach again very explicitly in my November post about the World Legal Information Institute was no mere coincidence. There is a possible complaint about my blog that I must mention here. If you had expected to find here only posts about the legal history of the Netherlands, you might turn away with at its best mixed feelings. From time to time Dutch legal history does get here fair space, but it seems wise not to focus solely on this relatively small corner of Western Europe. In fact Dutch legal history is a kind of mélange of influences from many countries. Its geographical position together with Belgium between France, Germany and the United Kingdom have made it literally into crossroads. Its small dimensions and its many and diverse connections with these countries make it very sensible to look abroad. The ever-changing estuaries of the Rhine and Schelde river have shaped my country substantially. A part of the Low Countries, the famous polders, have been reclaimed from the sea and lakes. They are literally man-made. My home town Utrecht started as a Roman army camp near the limes, the border of the Roman empire. This border, too, moved with the changes of the Rhine branches. Crossing borders and having to deal with them is perhaps almost a second nature for people living in such surroundings. However, geography does not explain everything, and it is rash to claim you can find here the only Dutch view of things. Creating my blog has helped me very much to cross borders more often. I thank you for your patience with my Dutch views, and as always I hope to welcome you here often to meet the varieties of legal history. This entry was posted in General and tagged Legal history, Netherlands on December 12, 2014 by rechtsgeschiedenis. Last week many media published the news about a drastic cut in the budgets of major cultural institutions in Belgium. In particular federal institutions such as the Bibliothèque Royale Albert I in Brussels and the Archives de l’État en Belgique, also in Brussels, face next year a loss of 20 percent of their yearly budget. I use here the French name of both institutions, but in particular on the website of the Belgian National archives you can immediately gauge the multilingual character of Belgian society. Belgium can be roughly divided in three parts, Flanders, Wallonie and the central region in and around Brussels, Belgium’s capital. The German-speaking minority in the region along the German border has in principle the same rights as the Flemish and Wallon communities. An online petition has been launched to give the protest against these plans a loud and clear voice, and I cordially invite you to share your concern about these proposals by signing this petition. You can read the content of this petition in four languages, Dutch, French, English and German. In this post I would like to offer a quick overview of some important digital projects in Belgium which help presenting Belgium’s cultural heritage. Some of these projects offer access to resources which are also important for the research of legal historians and for research projects concerning the rich history of law and justice in Belgium. When you look at the digital projects of the Royal Library and the Belgian National Archives it can seem at a first look Belgium’s national library has more to offer online than its counterpart in the world of archives. Just now there is very appropriately an exhibition about the First World War. However, in order to find the projects in the digital domain you will have to browse through various sections of the library’s website. A number of projects can be found under the heading Activités, but the digital library Belgica is tucked away among the catalogues. The variety of its contents, with apart from books and manuscripts also coins and medals, engravings, maps, newspapers and music scores, is such that it clearly merits a place of its own on the library’s website that shows a design which has changed little over the years. A number of manuscripts has been digitized for the project Europeana Regia. On my blog I have written twice about the presence of legal manuscripts in this project. Among the manuscripts is for example an illuminated French version of the Liber novum iudicum written in the second half of the fourteenth century (KBR, ms. 10319). You can search directly for digitized books in a special subcatalogue; a search for books concerning law (droit) brings you already some 160 books, and more can be found. The first look of rich digital repositories is somewhat dimmed by the fact that the actual number of digitized items is fairly restricted. The KBR does cooperate in many international projects: for example, the digital version of the Gazette de Leyden has been created in cooperation with the Belgian national library. On the national level the KBR supports the Flemish digital library Flandrica. This website with digitized books and manuscripts from six libraries working together in the Vlaamse Erfgoedbibliotheek [Flemish Heritage Library] is strictly in Dutch. For items touching upon law and justice you have to choose the theme Recht en politiek [Law and politics] which brings you to thirty digitized printed books and manuscripts. The number of items with a legal context in Flandrica is quite small but they cover a wide range of subjects and periods, from a canon law manuscript to the procedure at law in the county of Looz, and from medieval times to the early twentieth century. As for editions of books printed in Flanders between 1500 and 1800 you can search for them online with the Short Title Catalogue Vlaanderen. Digitized literature in Flemish can be consulted online in the Digitale Bibliotheek voor de Nederlandse Letteren (DBNL), where you will find also literature in Frisian and Afrikaans. Until recent the Belgian National Archives looked to outsiders as a very much centralized and not very active organization, but the first impression is not completely justified. The year 2010 saw the launch of a virtual exhibition about the dark sides of Belgian colonial history in Congo, Archives I presume? Traces of a colonial past in the State Archives. This year they launched a virtual exhibition concerning the First World War in Wallonie, Archives 14-18 en Wallonie. The website in four languages is being overhauled, and some parts are not yet available in English, in fact the overview of online databases did not exist at all at the time of writing. The search in archival inventories is an example. Here you can search both in scanned inventories and in digitized finding aids. Among the digitized inventories is for example the finding aid created by Jan Buntinx to the archival records of the Raad van Vlaanderen, the high court of Flanders [Inventaris van het archief van de Raad van Vlaanderen (Rijksarchief te Gent) (9 vol., Brussels 1964-1979)]. Recently the National Archives digitized the cabinet minutes created between 1917 and 1979; you can access these documents both in Dutch and French. The Recueil des Circulaires, official letters sent by the Ministry of Justice, have been digitized, too, as are a yearbook, the Annuaire statistique de la Belgique (et du Congo Belge) (1870-1995), and two juridical journals, the Revue Belge de la police administrative et judiciaire and La Belgique judiciaire. A third institution threatened by the budgetary cuts is the Cegesoma, Centre for Historical Research and Documentation on War and Contemporary Society. Precisely the attention of the research centre for periods in recent Belgian history with some very black pages and political reverberations until the very present has made it already earlier a target of Belgian politicians. Characteristically Cegesoma is among the first institutions to react in public to the announcement of the new Belgian cabinet. The institute argues that the proposed cuts will harm most drastically the work accomplished during decades and future activities as well. Cegesoma holds archival and audiovisual collections and a research library. You can search online for digitized materials, such as photographs, sound recordings, tracts, posters, archival records, diaries and manuscripts. One of the archives coming from the Ministry of Justice now in the holdings of Cegesoma deals with the Rijkswacht, the Belgian national police, between 1931 and 1947. One of the largest and most visible online projects of Cegesoma is The Belgian War Press which offers online access to numerous newspapers published during the First and Second World War, both by the official censored press and the clandestine press. The website of the Cegesoma has a very well-stocked choice of links to other research institutions and a fine selection of websites concerning the First World War. Legal history comes particularly into focus at Justice & Populations, a project with Cegesoma among the fourteen participating institutions. This project focuses on the long-term relations and impact of the Belgian judiciary in its widest sense and Belgian society in an international context from 1795 onwards until the present. it is unclear in which way this project will be affected by the new plans, but surely any change in the role of Cegesoma will have side-effects here, too. By the way, another Belgian project, Just-His, is very important for Justice & Populations.At Just-His you will find actually three databases, one on Belgian judicial magistrates between 1795 and 1950, a research repository and Belgian criminal statistics (only accessible after registration). Among the institutions governed by the national government is also the Commission Royale pour la Publication des Anciennes Lois, founded in 1846. This committee is responsible for many important editions of sources concerning the legal history of Belgium from the Middle Ages onwards, ranging from ordinances, charters and customary law to legal treatises and collections of verdicts. On its website you can find an overview of the publications and projects. The issues of the Bulletin des anciennes lois et ordonnances de Belgique published between 1909 and 1999 are available online (PDF’s). Let’s hope the projects coordinated and often done by members of the committee themselves will not be harmed by any of the proposed measures. Apart from archives and libraries museums, too, are included in the budgetary threats, but before looking at some museums I will look briefly at a higher level. The Koninklijke Vlaamse Academie van België voor Kunsten en Wetenschappen (KVAB) [Royal Flemish Academy of Belgium for Arts and Sciences] published in 2013 reports on the reform of the Belgian judiciary [De gerechtelijke hervorming: een globale visie (“The judicial reform, a global vision”)] and the role and significance of archives in Belgian society [Archieven, de politiek en de burger (“Archives, politics and the citizen”)]. 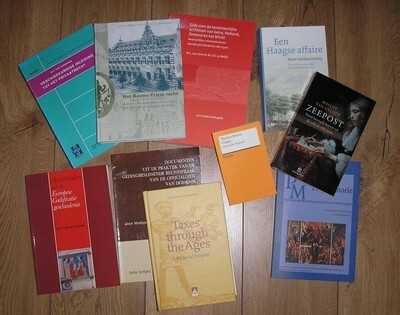 One of the standing commissions of the KVAB has legal history as its core business, with projects such as the bibliography of current research on Belgian legal history and the critical edition of the works of Philips Wielant. The KVAB provides on its website a searchable version of the Nationaal Biografisch Woordenboek [National Biographical Dictionary], a useful tool for legal historians, too. Among the targets of the cuts proposed by the Belgian government are a number of famous museums, for example the Royal Museum for Fine Arts, the Royal Museums for Art and History, and the Royal Museum of the Armed Forces and Military History, all in Brussels. Another royal museum, the Royal Museum for Middle-Africa in Tervuren, closed in 2013 for renovation. Its buildings and outlook had not changed substantially since its start in 1910 after a temporary exposition about Belgian colonial activities in 1897 instigated by king Leopold II. The museum had become an icon of Belgian colonialism, and later an outright offensive institution. A part of the ethnographic collections of the KMMA can be consulted online, including the Stanley collection. Hopefully the drastic renovation can be completed, but anyway it seems wise not to reckon absolutely with the projected reopening in 2017. What will happen exactly with all these institutions is not yet clear. It is necessary to look at both their physical and virtual existence. Federal support could be withdrawn or become less substantial in many ways. Flanders and Wallonie can boast cultural institutions with rich collections. The portal Numériques – BE: Images et histoires des patrimoines numérisés can bring you quickly to a selection of images from some thirty cultural institutions in Wallonie. Belgian Art Links and Tools is a portal guiding you to some 600,000 images concerning art in Belgium, and to several repertories. This portal has been created by the Royal Institute for Cultural Heritage, yet another threatened institution. The Flemish heritage portal FARO – accessible in Dutch, French and English – is in my opinion a good starting point for finding out more about the different forms of cultural heritage in Flanders and news about them, be they digital, immaterial or very material. If you think digital collections will more easily survive, the actual absence of several links pages at FARO is a healthy reminder of the fragility of virtual existence and preservation. It is quite a feat to maintain a multilingual website, and thus it is a bit too easy to grumble about such problems! Luckily the page with links to several Flemish portal sites can be viewed, with due attention for initiatives in Wallonie, and there is also a general links selection in English. Among recent news items at FARO I saw an announcement about a masterclass on Food in Prison, held at Brussels on October, 16, 2014. As for me I am genuinely surprised to learn much more about all these projects than i knew before. It serves me as a reminder that we Dutch are not always completely aware of what happens in Belgium, a sorry situation. Here I have tried to honour Belgium by creating in this post also a kind of nutshell guide to digital projects in the field of cultural heritage and legal history. Let’s support Belgian scholars and cultural institutions in their struggle to change the plans scheduled for the coming years, and help them finding the spiritual power and financial means to maintain existing activities and to work on new initiatives. These things will enrich Belgium and us more than any financial contribution can do, however welcome of course any support in hard money is. This entry was posted in General and tagged Archives, Belgium, Colonial history, Criminal law, Cultural heritage, Digital libraries, Legal history, Libraries, Museums on November 14, 2014 by rechtsgeschiedenis. In 2009 I started with a website dedicated to legal history, Rechtshistorie. Rechtshistorie is one of the two Dutch words for legal history, the other one is rechtsgeschiedenis. For me these two words stand as a symbol for the eternal changing appearances and forms of legal history. It is perhaps a truism, but there is no such thing as the legal history of any period, country or juridical system or phenomenon. Etymology is not my favorite aspect of language, but it is certainly interesting to play with the roots behind the two Dutch terms. In rechtshistorie the element historie is very close to the English and original Greek word for history. Historein (ιστορειν) in classical Greek means do research into, to investigate something. The word rechtsgeschiedenis has as its root the verb geschieden, “to happen” (compare the German verb geschehen). Geschieden has a more pregnant, indeed biblical sense than the more common Dutch verb gebeuren. Things and events connected with the verb geschieden have great impact and significance than ordinary actions. Legal history is not just a hobby-horse, a gadget of people who happen to be interested in the past or only something for people who we like to label as conservative. Legal history is part and parcel of history at large, and not just a minor element on the fringe of human affairs, but more often close to the heart of the matter. This week a technical issue behind the scenes of my website became suddenly urgent. Four years ago my website was off-line during a week. While working on a solution it became already clear that sooner or later I had to redesign a major feature of Rechtshistorie, the switchable menu in Dutch and English which helped creating its bilingual character. The former bilingual menu is not longer compatible with the new machinery inside the website. I have to choose a new menu tool from numerous options that will at least work as smoothly as the old one, preferably even better, and of course it will have to run easily with future updates. As for now I have installed a very simple new look for Rechtshistorie, with only an English version. Apart from the bridge shown in the header the other header images will reappear, too. The Dutch version is ready for its relaunch, but first a new menu has to be tested and tuned. I will look into possibilities to test off-line in order to avoid troubling any visitor with my experiments. As a consequence I cannot maintain here the same current publishing rhythm with at least two posts every month. At the same time I have to adjust also the layout of the blog I started last year about medieval juridical glosses, Glossae, and to add new posts to it which are long overdue. 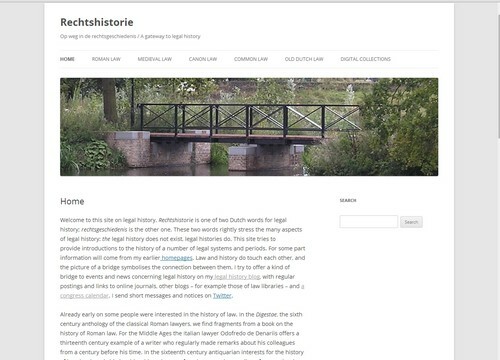 To the new look of Rechtshistorie I have added a subtitle, Op weg met rechtsgeschiedenis / A gateway to legal history. If you look closely at the screen print above you can read a slightly different first version of the Dutch subtitle, Op weg in de rechtsgeschiedenis, “On road in the legal history”. Using an article to create a unified form of legal history remains seducing! This entry was posted in General and tagged Legal history on May 26, 2014 by rechtsgeschiedenis.